The Bags of Love: Domestic Violence Awareness Charity Event will take place on Saturday, October 17, 2015 from 3:30pm-5:30pm at the Smyrna Community Center (200 Village Green Circle. Smyrna, GA 30080) . 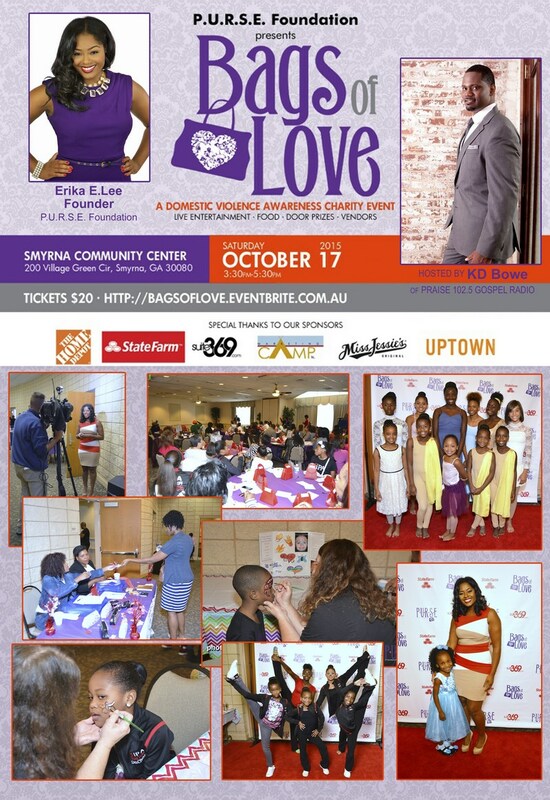 Tickets are $20 which can be purchased by clicking on the following link: http://www.bagsoflove.eventbrite.com.au or at the door, children under 12 are free. The event will be hosted by 102.5 Gospel Praise Radio Personality KD Bowe (KD) & include Special Guest Yamma Brown, Keynote Speaker Yolan Henry, singers, dancers & domestic violence survivor stories; all to bring awareness and encourage anyone who may be experiencing any form of abuse to walk away from an unhealthy relationship. Door prizes, complimentary gift bags, food and vendors will be available. This event will serve to benefit everyone in the local community and is open to families. The donations raised for this charity event will allow P.U.R.S.E. Foundation to continue hosting free teen dating workshops at foster care facilities, schools and shelters.